SUCCESS! From High School to Career. Experiential Learning at its finest. The site also worked well for Meagan Luftman. A recent graduate of Robert Bateman High School in Burlington, Meagan knew she wanted to pursue her interests in cooking and baking after high school. 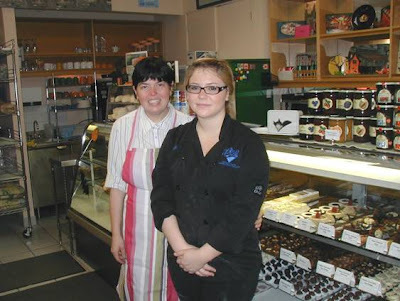 She developed her culinary skills while in school by completing a co-op placement in a local bakery and participating in regional and provincial skills competitions. Meagan agrees there’s a lot to learn. “I never really have done serious French baking before. I’m constantly learning new things as we prepare croissants, tarts, cakes, and pastries – all freshly made on the premises. It’s been a great experience for me,” she said. Monica’s husband Jean-Luc is the pastry chef who oversees Meagan’s training. Patisserie D’Or (see www.patisseriedor.com for additional information) has registered Meagan as an apprentice with the Ontario Ministry of Training, Colleges, and Universities. She hopes to attend George Brown College in Toronto for the in-class portion of the apprenticeship at. In the meantime, the on-the-job training (and learning) in Oakville will keep her busy! Great Hamilton Opportunity! Must be at least a registered 1st year HVAC but are hiring for all apprenticeship levels. Register on the website and upload your resume for FREE once approved you can search all the skilled trade apprenticeships on the website. Thanks to everyone at apprenticesearch.com for another great year of racing. Our team had many highlights this season. We set a Pro Challenge track record for qualifying and won 3 races including a 50 lap special event. Thanks to all those who cheered for our team this year. We will be back next season looking to move up one more spot in the championship. The Celebrate Ten Count Contest is now closed and winners will be announced soon. You will be notified if you are a winner. A list will be posted at a later date. Check out our contest where you could win 1 (one) of 10 cash prizes of $100. See our June newsletter for details! We were optimistic that the rain would hold off all night. The repairs to the car were all good. The car was very fast and drove well. After a couple of small adjustments to the brake system, we were right where we needed to be. Unfortunately we needed to be under our tents as the rain came and washed away any hopes of racing. Looks like Flamboro will be it for the year. Hope to see everyone out there cheering us on. Let's hope for some nice weather. Kawartha was a rough night for the appsearch team. We were pretty quick in the heat race and had a good run going for the feature. A change in the schedule made our choice of set up wrong. The car was too tight and the front tires were just pushing along the track. We will remember that for next year. On the last lap we attempted to pass for 4th position. The 40 car drove it in way too far and he started to spin right in front of us. I lifted off the gas as he body checked our right front. This allowed him to save his car and allowed us to get spun by the car behind us. Not too bad, we didn't hit anything, or so I thought. It seemed like a long time watching cars fly past me facing the wrong direction on the track. Then the last 2 cars got together way back in the corner. I watched them touch once, twice and start spinning towards me. They got bigger in a hurry. Next thing I know the 60 car is almost on my lap. So we had to say good bye to the left front of the car, to bad it nearly made it all year. Testing on Tuesday found some issues and we repaired them easily. Off to Sunset. In our quest to make Apprenticesearch.com even easier to access, we are currently investigating the development of a SmartPhone version (for Blackberry, Android, etc.) and an iPhone/iPad/iPod “Apprenticesearch App” of our website & job bank. Could you please help us, by completing a very brief survey (only 5 questions): click here? Please feel comfortable to let us know if and how these new versions would assist you with your students/clients. Also, please share this link with anyone who would be interested. We want to hear from all potential Apprenticesearch users, including educators, employers, community agencies, students, job seekers and more. There will be a draw for a $25 gift card for 1 lucky participant. The weather was terrible all the way to the front gate of Sauble Speedway. As soon as we pulled in the rain stopped and the sun tried to peek out from behind the clouds. We had a new procedure for qualifying at this race. Our series mandated transponders to allow official times to be documented. With the system up and running we did 2 laps of qualifying. One by one the drivers took to the track. Each trying to be faster than the car before them. We qualified second last based on points. Our first lap was nothing to write home about, 6th on the speed chart. My plan worked as the heat built up in the tires just enough. Lap 2 was great, the only car in the field to break the 16 second mark. 15.87 secs. We were 3 tenths faster than anyone else and on the pole position for the feature. With our inversion to set the field we lined up in 7th for the start. we wasted no time getting to the front, on lap 10 we set sail, but we had an anchor behind us. The 02 car was glued to my back bumper. This is the first 50 lap feature we have run in 3 years. I know I had the fastest car, but how fast is fast enough to last 50 laps on the tires and brakes. I drove smooth, Dave called a great race on the radios, and we saved the car for the end. Just in time for a caution with 4 laps to go. There went my 3 car length lead. Why make it easy. On the restart the track was very slippery from the oil from the 16 cars blown motor. I had a decent restart and pulled a little on second place. Another caution came out for contact. All I needed was another good start and no mistakes to take the win. We did and on the last corner I drifted a little high. The 02 drove to the inside and we went side by side across the line. I was ahead by half a car. It was a great night for our team. Thanks to the rowdy fans up in turn 4 for cheering so loud. 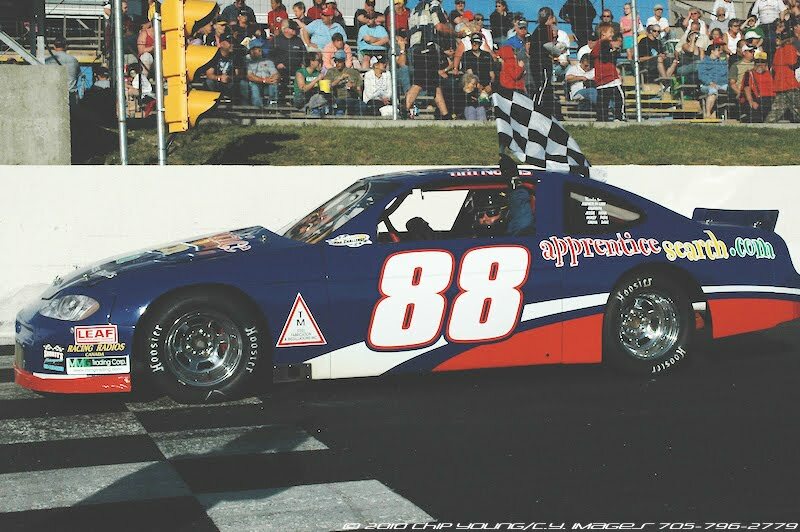 Up next is Kawartha Speedway, we won there last year and hope to repeat. Finally a perfect day of racing. The weather was warm, a nice breeze and a trip to our local speedway. After the short drive down the road, we unloaded the car and could just relax. It was a big race night for our division and for the late models. All the fastest drivers were there, including some Nascar Canadian drivers. It was good to see the driver I had spotted for some many years ago. He was now spotting for the 66 car in our series. We had something to prove. Add into the mix we had about 75 relatives and close friends at the track. We kept to ourselves and stuck to our race plan. In the heat race we finished second, we almost completed a pass for the win but backed out. The feature we started near the back of the field. We wanted to be out front early on and passed cars as quick as we could to get there. Just before half way we took the lead and set sail. Then we had a series of HUGE wrecks. Some of the cars were really destroyed. A couple of red flags and what seemed to take forever to clean up the mess, we went back to green. This was starting to feel like Mosport all over again. This time we put in solid lap times and stayed in the best racing groove we could. On lap 30 we took the checkers and started our celebration. We were perfect in tech lane and the win was ours. Thanks to all who came out to cheer, support and just say hi. It is great to win on our home track. This gives us a little more confidence going to Sauble in a couple of weeks. Next up 50 lap feature and 2 laps of time trials. Should be some fun. See you at the beach. One of the most valuable safety related tools, isn't a tool at all. Recently we have implemented a mandatory morning meeting. We call it the toolbox talk. All employees are brought in and we discuss the days workload, process and hazards. We include all the employees and ask them for their input. We have found a reduction in injuries, and the shop is more organized. Everyone receives the same information and they can all work together to ensure the workload is organized and executed safely. Once all the hazards and safety measures have been discussed, we write them in the book and everyone signs off that they have the proper instructions for the day. The meetings bring everyone together and we have different employees give the talk. Once everyone has had a turn at it they become more comfortable and the meetings take about ten minutes. From a supervisors standpoint, a ten minute meeting can save hours of paperwork from injuries. Toolbox talks are fast and easy, try them for yourself and get everyone involved. tradesperson, including tool and die makers, machinists, millwrights, welder-fitters, and electricians. IMS is very committed to apprenticeship; Dave Tullis, the owner and founder, started out as a tool and die and millwright apprentice himself, and understands the importance of this type of training. Many of his staff are both licensed tradespeople in one trade and apprentices in another. All the employees work closely as a team and frequently learn from each other. It’s an environment that greatly benefits new apprentices joining the team, as they can develop a wide range of skills and get exposed to a wide range of challenges. This report sets out a number of recommendations to support the creation of a College of Trades which, if adopted by the government will, in my view, contribute to the modernization of the apprenticeship and certification system in Ontario to make it more responsive to economic needs while enhancing the status and effectiveness of apprenticeship trades in the province. Are You Interested in Being Profiled on the Canadian Apprenticeship Forum (CAF) Website? - What influenced you to apprentice in your trade? - How you went about finding an employer? - What challenges you faced? - How you addressed those challenges? Times are changing and so are skilled trade jobs. Take a look at what is coming available Green Jobs Initiatives Report and Career Profiles. .